This anti-aging serum contains 4% of peptides from the temple viper. It is perfect to greatly reduce and fill wrinkles. Combined with aloe vera and hyaluronic acid, this product is an ideal ally for younger and firmer skin. The Skincare Snake Active Serum is a rejuvenating skin treatment that tackles all signs of aging. Its powerful natural ingredients work to leave skin looking more lifted and youthful, with a natural glow. The Snake Active Serum contains the natural wonder ingredient of snake venom: viper venom peptides, that help to fight against fine lines, crow's feet, and wrinkles. It has a lifting effect on the skin, giving the complexion a tightened, lifted, and smoother appearance. This anti-age serum also contains hyaluronic acid, retinol, organic silicon, hydrolysed soy, collagen, elastin and tocopherol, which plump skin so that it regenerates and looks smoother and more refined. Olive, corn, and wild rose oils are extremely hydrating, targeting areas with dehydration issues and dry, flaky patches. 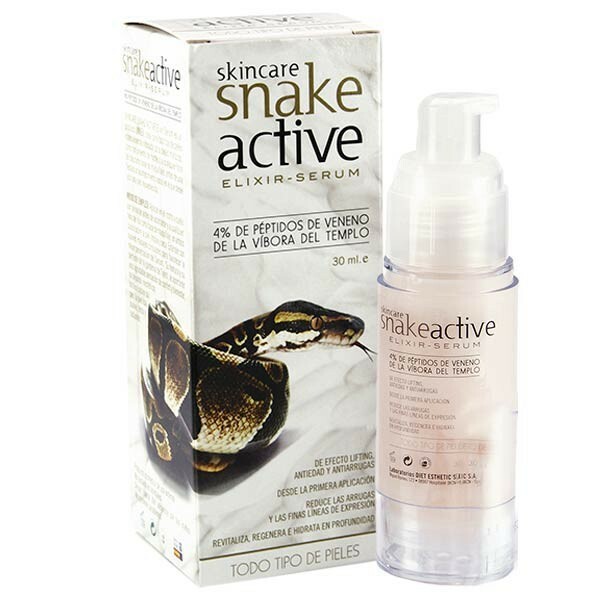 The Skincare Snake Active Serum with snake venom should be applied morning and night, massaged into the skin in small circular motions. Aqua (Water), Aloe Barbadensis (Aloe Vera) Leaf Juice*, Cyclopentasiloxane, Glycerin, Persea Gratissima (Avocado) Oil*, Glyceryl Stearate, Dimethicone, C12-15 Alkyl Benzoate, Hydrolyzed Collagen, Ceteth-20, Cetyl Alcohol, Dimethiconol, Sodium PCA, Rosa Moschata (Musk Rose) Seed Oil*, Glycine Soja (Soybean) Seed Extract*, Zea Mays (Corn) Oil*, Dipeptide Diaminobutyroyl Benzylamide Diacetate, Hydrolyzed Elastin, Sodium Hyaluronate, Silanetriol (Organic Silica), Calcium Pantothenate, Inositol, Retinol, Biotin, C30-45 Alkyl Cetearyl Dimethicone Crosspolymer, Bisabolol, Farnesol, Benzophenone-3 (Oxybenzone), Ascorbyl palmitate, Tocopheryl Acetate, Xanthan Gum, Sorbitan Oleate, Polysorbate 80, PEG-20 Castor Oil, PEG-60 Hydrogenated Castor Oil, Stearyl Alcohol, Behenyl Alcohol, Isohexadecane, Alcohol denat., Sodium Chloride, Acrylamide/Sodium Acryloyldimethyltaurate Copolymer, Coumarin, Limonene, Linalool, Benzyl Salicylate, Butylphenyl Methylpropional, Hydroxyisohexyl 3-cyclohexene Carboxaldehyde, Parfum (Fragance), Sodium Gluconate, Phenoxyethanol, Sodium Benzoate, Potassium Sorbate, DMDM Hydantoin, Sorbic Acid, C.I. 16255 (Food Red 7).